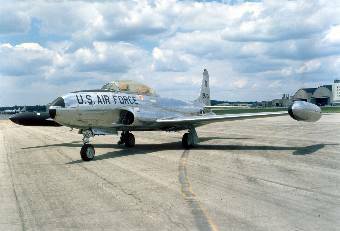 On August 7, 1951, a T-33 trainer jet with two men aboard left Otis Air Force Base in Falmouth, Massachusetts, for a training flight to Griffiss Air Force Base in Rome, New York. The pilot was Major C. H. Imschweiler, 34, of Schuylkill, Penn. The second man was Lieutenant John A. Carver Jr., 30, of Ann Arbor, Michigan. When the plane reached Griffiss, they encountered bad weather, and made two unsuccessful attempts to land. By this time the T-33 was low on fuel, and rather than risk another attempt at landing, the crew was advised to fly north and bail out of the plane. At 6:03 p.m. Imschweiler radioed Griffiss that they were bailing out. Nothing more was heard of the plane, and large-scale search and rescue operation was begun. It took five days to locate the downed aircraft . The crew was found to be still inside the wreck.